Mike Kirby has been a regular at Ferry Meadows over the past couple of seasons and it has paid off with huge nets of bream throughout the summer months. On his latest trip Mike caught just over 40lb on a groundbait feeder and with the lakes holding good colour, this weekend could be well worth a visit with conditions as good as you are going to get at this time of year. Ramsey & District Angling Society have some of the best winter waters on their books right now. Factory Bank is a favourite for many, but the Ramsey St Mary’s stretch of the Old Nene is surely equal to it looking at the fine results coming from it. In the latest Ramsey club match Paul Kilby drew the noted end peg at the church end of the length and caught well on pinkie, but added a bonus tench and three big perch to give him the edge over the chasing pack with a level 25lb. Pushing him all the way was Ken Taylor, who also had a tench to add to a fine net of roach, rudd and perch for 22lb 2oz. Third was Andrew Kilby with 12lb 4oz, followed by Ray Myring on 11lb 9oz. Ramsey rod Roger Gowler won the weekly Sunday match on the Six Island Pool with a haul of 88lb 14ozs. Andy Gausden was second with 84lb 4ozs and Ernie Lowbridge third on 65lb 6ozs. One of the biggest matches over the Christmas holiday period was round two of the Tony Evans Winter series fished on the Beastie and Horseshoe Lakes on the Decoy complex. Leading the way with a very impressive 1601b was Simon Godfrey, who drew peg 15 and caught well all day fishing pellet at full depth on long and short pole lines. The runner up spot went to Rob Goodson on Horseshoe peg 6, who caught 120lb of carp, the majority falling to a pellet waggler approach, most unusual at this time of the year. Gavin Butler took third place catching on the pole with maggot for 104lb. Webb’s AC made the short journey out of town to fish on the Horseshoe Pool at the Float Fish Farm Fishery . Top rod from peg 12 was John Brodie, who fished a small maggot feeder over to the island to finish with 36lb 4oz which gave him his first win for the club. 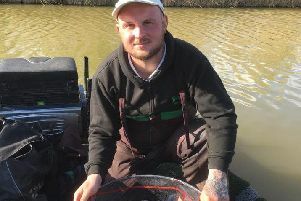 In-form Harry Murphy came in a close second fishing a groundbait feeder and pole for 34lb 11oz, followed by Peter Telszewski who weighed in a level 26lb. There is little doubt that Sensas Mark One rod John Taylor is one of the top anglers in the area. Of late he has been all but unbeatable in both the Whittlesey and Tydd Gote matches and in the latter’s match fished on the North Level Drain he even gave up what most would consider to be the best peg on the length, and yet still took the honours. John fished a groundbait and pinkie approach taking a net of roach to top the field with 10lb 3oz. Second place went to John Young who came close with 9lb 12oz of roach and skimmers followed by Don Green with a level 9lb. In Sunday’s club match there was a big turnout for the Christmas match. Leading the way in this one was Paul Bawden, who fished the whip with pinkie and maggot catching fish to hand all day to record 9lb 9oz. Second place went to Sammy McSpadden, who caught roach on the pole to finish with 8lb 9oz, then came Colin Gibbons on 7lb 11oz. Roy Whincup rounded off a fine pre-Christmas campaign on local stillwaters by taking the top spot in the Over 60’s match at Rookery Waters fished on the Jay Lake. Roy caught small carp on maggot from peg 45 to finish with 27lb 4oz. Ken Gammon took second place on 23lb followed by Bob Coulson on 18lb 4oz. Tony Moulds was a comfortable winner at Haddon Lodge at the weekend. He fished maggot on the pole and feeder to put 22lb 1oz of skimmers to the scales. Some way behind were George Bates (second) and Lucio Melillo (third). Every Sunday without fail JVAC have a match on the Decoy complex and last weekend they had a very good turnout with most pegs taken on the Six Island pool. Out in front was Ramsey rod Roger Gowler, who drew peg 8 and caught on the pole with pellet and sweetcorn for a winning 88lb 14oz, some on the long pole with a few fish late on from the margins. In second place on the opposite bank was Andy Gausden, who fished the long pole feeding and fishing red maggot to weigh in 84lb 4oz. Third place went to Ernie Lowbridge on peg 18, who fished maggot on the pole for 65lb 6oz. Bank Holiday Monday saw an impromptu sweepstake take place on the Beastie Lake at Decoy and once again it fished really well. Top rod was John Whincup, who managed to draw hot peg 15 out of the hat and took the honours with 105lb. He caught a few on the feeder, but it was his performance on the pole with maggot that did the damage. Runner up was yet another angler at the top of his game at Decoy right now, Chris Barley. He caught 87lb 6oz to see off the challenge of Huntingdon rod Andy Leathers who put 85lb 2oz to the scales for third place.